Whitepapers - Instrument Technologies Inc. Continuous Improvement (CI) implementations can make significant increases in processors’ and manufacturers’ operational efficiencies, productivity, and contributions to profit. CI does this by improving or maintaining product quality and safety, reducing losses, increasing efficiency, and improving safety, hygiene and environmental conditions. The foundation of CI opportunity identification and remediation is to accurately and reliably measure the inputs to, and outputs of, the materials, processes, equipment, and environmental stages of processing and manufacturing. 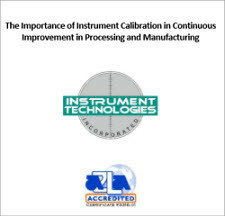 Instrument calibration, when periodically performed by qualified and accredited calibration and metrology organizations, will ensure that measurements are, and remain, accurate and reliable, and that the CI assumptions, decisions, and actions based on them are valid. Click here to download whitepapers.